Pirates of Black Cove: Sink 'Em All! Prepares to Set Sail! Shiver Me Timbers! 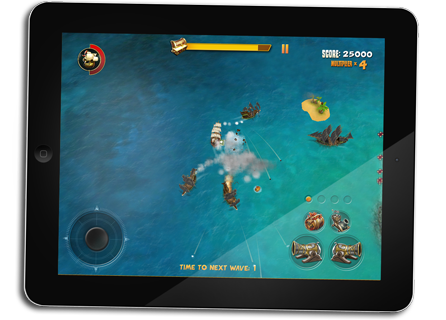 A brand-new top down, Free-To-Play Seadog shooter App for iOS devices coming out this autumn from Nitro Games! Three chapters each including six levels with waves of badass Black Covian ships. Cool ammunition to shoot them into kingdom come: Balls of Steel, Blue Balls, Great Balls of Fire, Human Catapult, Fart Bombs, Homing Missiles and more. Bosses who, among other things, have tentacles. Tentacles! Game center: show the world that you are the man by dominating the online charts! So me mateys prepare for some fast paced naval combat and equip yourself with some "special weapons" to defeat those wantin' to steal yer treasure! is a trademark of Nitro Games Alpha Ltd. All rights reserved.